I keep thinking “I feel like I’m going crazy.” I know it’s a thought. I’m experiencing crazy. Last night I slept in a chair in my living room. By 4am, several hours into an SVU marathon, I was so confused. I felt my eyes melt and roll down my face and was convinced the computer chair in the kitchen was going to kill me. It was safer just to sleep. I went to group tonight. I did pretty well except for not being aware enough of the people around me, which is something I’m usually good at. I expect decompensation in the winter and summer but I’m not sure how to combat it. Jenga explains everything. 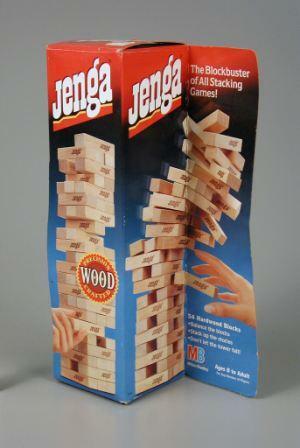 If you’ve ever played Jenga you know there are 3 blocks at the base of that skinny tower holding everything up. The object of the game is to remove as many pieces as possible placing them on top to make it taller. Each of the other levels starts with 3 pieces too but the foundation is the most important. For me those blocks are Music, Safety/Food/Sleep, and Therapy. If I don’t have the safety piece, music and therapy can still hold me up. But if music and therapy/support are out and it all rests on food & sleep, anything can topple the tower. Right now the whole thing is teetering. I’m on the edge looking down. Don’t take that piece! But it’s scheduled to be taken the 19th, like wisdom teeth. And I don’t know what to do. The blocks higher up in Jenga: Life Edition don’t seem equally as strong as the wooden ones.